I sure didn’t mean to drop off for so long but there it is. Time passed with little to show for it on this here site. Sometimes life requires full attention and quiet. But, in that quiet time I took, I’ve done a whole lot of learning. As I mentioned in my last post, when winter was still hanging on with a mighty grip, I made my way up to Montgomery, Vermont with my friend Susi, of The Felted Gnome Knows, to visit Mountain Fiber Folk. I’ve spoken about the wonderful ladies who fill their co-op store with gorgeous wools, handspun yarns, woven, knitted and needle felted creations. It’s just all so lovely. One of my friends there sold me a loom she’d had tucked away for some time. A four harness, counterbalance, Leclerc Mira Loom from the early 80’s. Then I spent some time feeling very intimidated and concerned I’d bitten off more than I could chew. But thankfully a fabulous woman answered my call for a teacher to help me! Lausanne Allen demonstrated downright genius when helping me to get to know my loom. Her patience was remarkable. And now, three projects in and I’m feeling okay, like I might be able to do this weaving thing and like I might need to just stop now with the whole being-afraid-of-math thing. I’ve been spinning some wool, too, and doing a bit of knitting because knitting wooly things in summer somehow works for me. I have so much to write to you about and plan on keeping up with my blog again, at least once a week. I hope you’re all doing just fine. Categories: Handcrafting, What I'm Doing | Tags: art yarn, handspinning, handspun, handwoven, handwoven baby blanket, handwoven dish towels, handwoven napkins, knitting, Leclerc Mira loom, mountain fiber folk, spinning wool, weaving | Permalink. If you told my 18-year old self that one day I would be more than delighted to treat myself and family to a brand new dish towel for Valentine’s Day, I would have probably swam to a different land in an attempt to start over, reboot, reset my course to avoid such a fate. I’m so relieved no one meddled with my future in such a reckless way, because now I am the proud owner of hopefully the first of several hand woven towels made at the Marshfield School of Weaving. It is gorgeous, sturdy, soft and functional. It took time, great skill and a dedication to an “old” way of making. It felt like a decadent, yet moral and tame purchase. We will have this towel for decades, I’m sure. And every time I dry my hands, wipe up water or dry a pot with it, I will think about where it was made. I love this more than champagne and chocolate. Go to Frog Hollow in Burlington, VT to see a lovely exhibit from the Marshfield School of Weaving. It runs through the end of February and won’t disappoint. 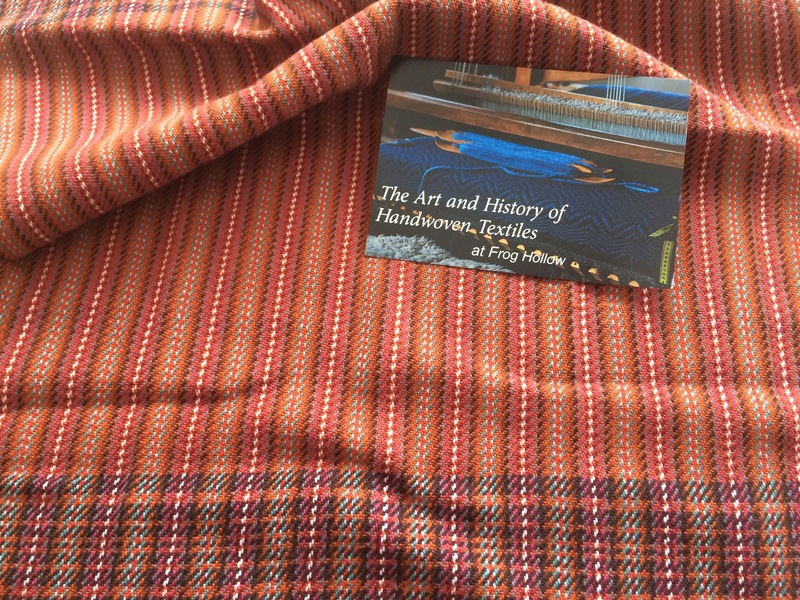 Categories: Healing and Handcrafting | Tags: Frog Hollow, functional beauty, handwoven, handwoven dish towels, heirloom, Marshfield School of Weaving, perfect gift, textiles, tradition, Valentine's Day | Permalink.